The core of the ICP methodology are the Energy Performance Protocols that define a standardized road map of best practices for originating energy retrofits following the ICP Project Lifecycle. They leverage existing and commonly accepted standards such as ASTM-BEPA, ASHRAE Guideline 14, and EVO-IPMVP in conjunction with ICP specified elements, procedures, and documentation based on the various stages of a project life-cycle to create standardized projects with reliable returns. 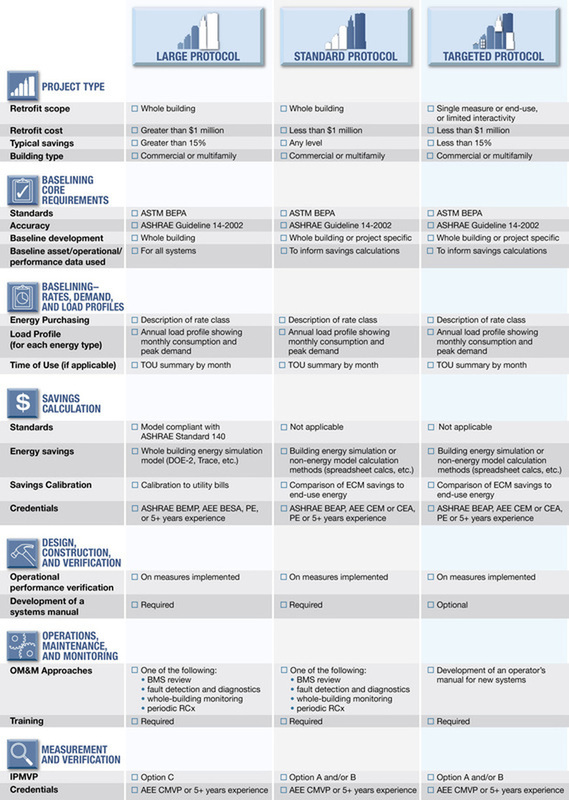 There are six protocols which cover the majority of commercial energy efficiency projects. Protocol selection is based on building type (Commercial and Multifamily) and on project size and complexity including Targeted, Standard, and Large - spanning single measures to whole building deep retrofit. Click the links below to visit each protocol and the image on the right for an overview of the primary standards being leveraged. Use of the Project Development Specification is easy (see quick blog). It is linked to all of the ICP Protocols and directs users to the relevant section of the Specification to explain exactly what is required. When preparing a project using the protocols as your guide, developers can easily jump from whatever protocol you are using directly to the appropriate section of the PD Spec to find out in detail what is required. 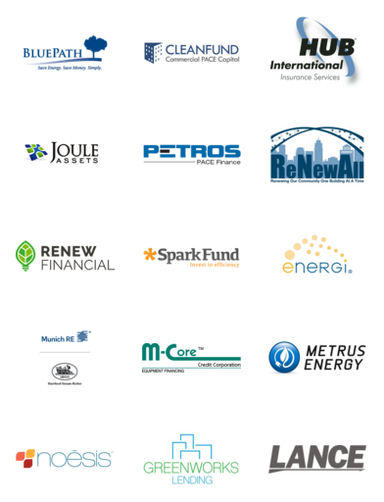 The ICP Credential System combines the use of the ICP Protocols, existing industry certifications, and third party verification to create Investor Ready Energy Efficiency™ (IREE) projects that provide investors and building owners with a new level of confidence in project engineering, performance and returns. IREE projects are akin to audited financials and other industry workflows that have paved the way towards securitization and classification by ratings agencies. The system is comprised of three provider credentials and the Investor Ready Energy Efficiency™ project designation. The system workflow leverages credentialed Project Developers who originate projects and proposals, credentialed Software Provider applications that can automate the process (optional), and credentialed Quality Assurance Providers who will perform a third party review utilizing ICP’s QA resources. 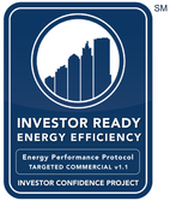 Conforming projects will then receive the Investor Ready Energy Efficiency™ designation. The result of the ICP Credentialing System is Investor Ready Energy Efficiency™ projects. 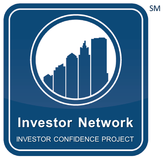 Investors and decision makers of all types, especially building owners, can be confident that these projects will be engineered, installed, operated and measured using consistent industry standards in order to deliver predictable returns. The ICP Quality Assurance (QA) process implemented by Credentialed QA Providers is an integral part of the creation of IREE projects and associated increased confidence by project stakeholders. The ICP System requires verification by ICP Credentialed Quality Assurance Providers, who have been vetted by ICP, to ensure that they possess all necessary qualifications and certifications to provide Quality Assurance for a project developed according to the ICP Energy Performance Protocols. The ICP Quality Assurance process and credentialed providers are supported by the ICP Quality Assurance tools consisting of the ICP QA Checklists and the ICP Quality Assurance (QA) Specification which is a comprehensive resource designed to standardize the evaluation criteria and methodologies used by ICP Credentialed QA Providers. It provides essential information regarding the Quality Assurance (QA) Provider’s qualifications and responsibilities, as well as a description of how the ICP QA process integrates with the overall ICP System and development of ICP Investor Ready Energy Efficiency™ projects. Investor Ready Energy Efficiency™ refers to and provides information about energy efficiency retrofit projects that conform to the requirements of the ICP Energy Performance Protocols, and have been originated by a credentialed Project Developer and verified by a credentialed Quality Assurance Provider. 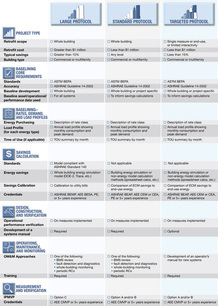 To conform to the ICP Energy Performance Protocols, the Project Developer must select the appropriate protocol for their project and then conduct all required steps for baselining energy usage and predicting savings, and include specific plans as specified for commissioning, operations and maintenance, and measurement and verification. Details of all requirements can be found in the protocols themselves or the reference ICP Project Development Specification.